Frost has not lifted off Northern Kyrgyzstan for the past two weeks, reaching unfamiliar temperatures of -15 to -20 C. Now people often recall that only this autumn Kyrgyz officials assured the citizens that “the country is prepared for the winter season.” Of course everything turned out to be quite different. The people of Bishkek met winter face to face on 12 December, when gas was switched off in the suburbs and in some of the city’s boroughs. The situation got worse on 14 December, when the gas switch-off spread. Central heating has not been connected in all the houses in Bishkek, especially not in the newly built blocks, so the lack of gas became a catastrophe for Bishkek and its surroundings. 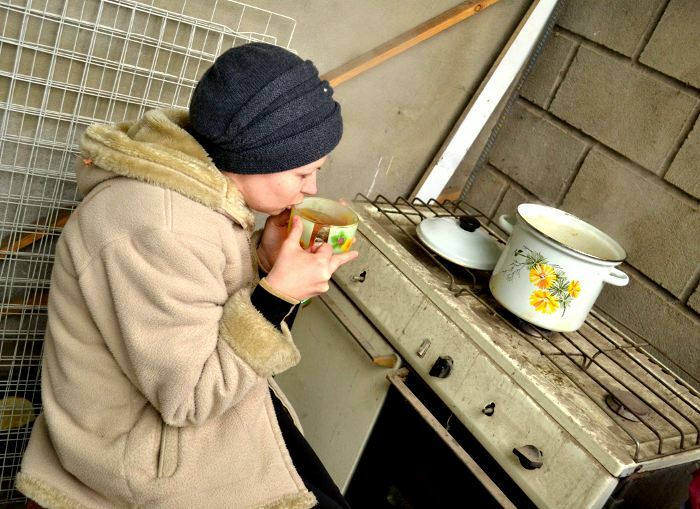 People started using alternative methods of heating: stoves and heaters. The electricity grid could not handle the increase in pressure: electricity blackouts are back in the city. Not only could people not warm up – they could not even cook their food or make hot tea for their children. The unfamiliar frosts led water to freeze in the pipes and ice to form on the walls. Those who could went to stay with relatives in flats or rented them for the short term, others, especially single pensioners, tried to warm up using wood and coal. But even this is not enough. 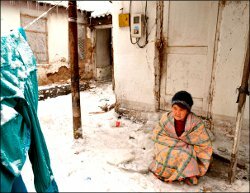 People freeze, temperatures are barely reaching 10-15C in the homes, and people are asking for help. According to the republic’s prime minister, Kyrgyzstan’s debt to KazTransGas is $3.5 million, but the republic does not owe Uzbekistan anything. At today’s meeting of the fuel and energy complex and subsoil use parliamentary committee it was announced that Kyrgyzstan’s energy minister Avtandil Kalmambetov will go to the talks on gas supply. Nevertheless, Kyrgyz officials have been unable to name a date when gas supply will re-start, having limited themselves to simply saying: “suppliers are promising to re-start gas supply to Northern Kyrgyzstan next week.” Kuralbek Naskeev, deputy general director of Kyrgyzgas said this at the press-conference on the previous day. After that, Satybaldiyev told all Bishkek’s residents that they “could have had some coal in reserve.” “How many times have we told people to prepare for winter, but they still make mistakes. I hope that the people take account of the mistakes that they made themselves when preparing for winter,” Vecherniy Bishkek quoted Satybaldiyev as saying. The prime minister did not answer who will be held responsible for the lack of gas in people’s homes, only saying that this is not the problem of specific officials. “The situation with suppliers and problematic subscribers, who do not pay their bills, are to blame for the lack of gas.” He then went on to make the people of Bishkek even happier by saying that gas will be switched off for the entire winter. The official, who moves around town in a Toyota Prado and lives in a residence where heating is certainly not from log fire, has not managed to understand to what despair people have been driven. Moreover, the residents have started to protest. So far the protests are small in number. Yesterday, a small number of people who have been left with no light and gas came out onto a square to talk about their problems. They were not out for long, because it was cold. Chief editor of MK Asia newspaper Ulugbek Babakulov organised a protest in the evening of the same day. 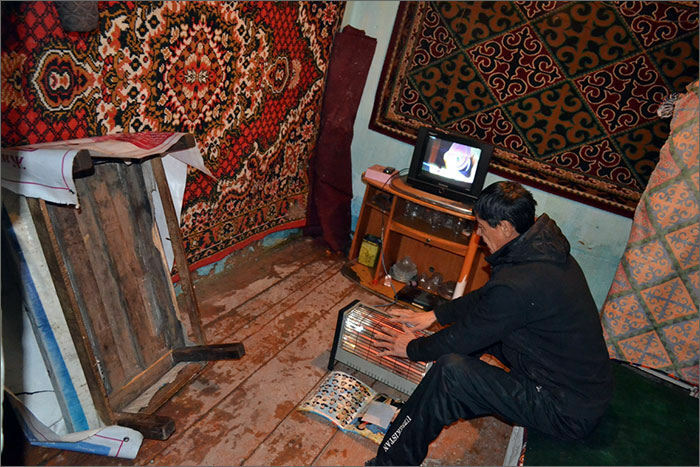 The famous journalist lives in the Prigorodnoye village near Bishkek, where gas has been switched off. Babakulov’s protest action was to set tyres on fire. “I am moving on to active forms of protest. My gas has been switched off and I don’t know when it will come back. And all this because of the lies of the gas company’s managing director, who said that there are no debts. Of course the electricity networks are going, because people are charging up on the electricity…Yesterday I tried to defrost the frozen water pipes, which have frozen at some point in the pipeline…it was useless…Now we have no water, no gas, no heat and with the possibility of electricity being switched off,” Babakulov said on his Facebook page. The protest went well. He was supported by residents and the media. “Next time we will warm up somewhere else, in Zhantoro Satybaldiyev’s home for example. I do not think that his gas or electricity has been switched off…and we have started resembling Pamir Kyrgyz. I have been there in the summer. It’s all the same there: no gas, no light, no conveniences, you can’t even go to the toilet because it’s dark,” said Babakulov at the protest. On 18 December, when temperatures reached -20c, I went to boroughs left without gas and electricity. I first visited Pervomaisky borough in Bishkek, near the Osh market. On the morning of Saturday 15 December, the Ala-archa river broke its banks and flooded seven homes on Ryskulov street. The water instantly turned into ice at these temperatures. 27 evacuated residents were put up in school No31. Hot food and warm blankets were given to the flood victims. The people returned three days later and saw their iced homes. On the way to Ryskulov street I saw a group of emergency services employees lazily standing around, they are tasked with cleaning up the river. Yet, during the hour that I spent in these houses, I did not manage to see any real action from the emergency services. Only about 20 bags of sand lay by the river side – proof that at least some work was done. I barely managed to enter one of the courtyards, I almost broke the gate – the entire courtyard is covered in ice several centimetres thick. I was surrounded by dogs and then saw two frozen puppies. I entered the home of Mairamgul Zhanyzakova. There were doormats frozen into the ice in the corridor. 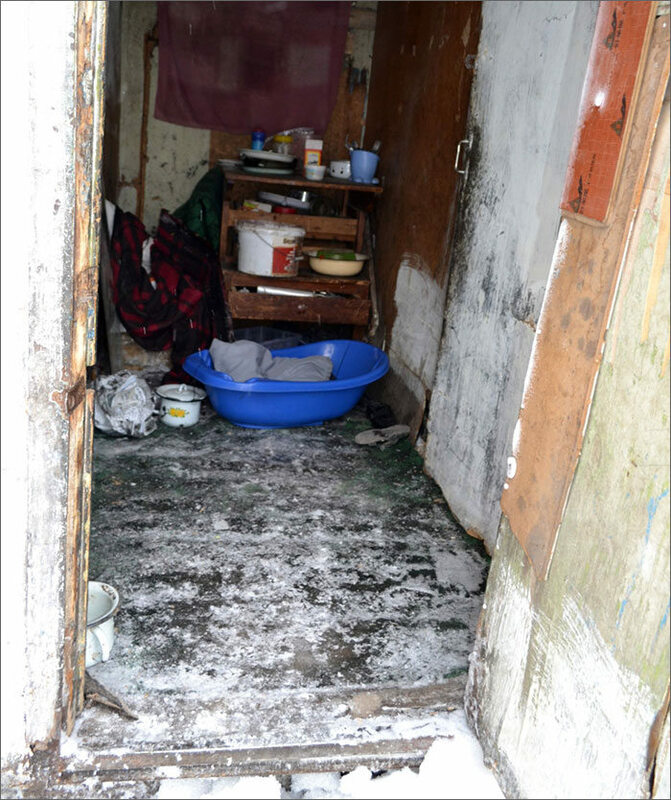 The living room, which is barely heated by a weak radiator, had wet wooden floors and a totally wet carpet stood by the wall. Her son was warming his hands by the radiator, and family photographs were drying. People say that they have not been given any help, apart from being taken to the school and are asking the emergency services to at least clean up the ice in their courtyards. After that I passed by Osh market. It is not as lively as normal, but it is still open. “And what else can we do? We have to make money for our bread somehow,” said the sellers wrapped up in layers and shaking from the cold. Even hot tea won’t save them. 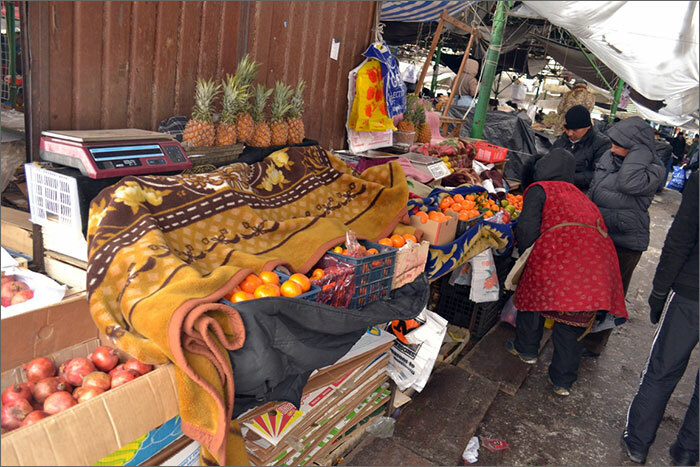 The frost does not spare the fruit and vegetables either, which the sellers carefully cover with blankets. The potatoes and oranges still felt frozen. The third and last borough that I visited is a working town, one of the private sectors of Bishkek, which has gas and electricity. I went into Lada Degtyareva’s home. 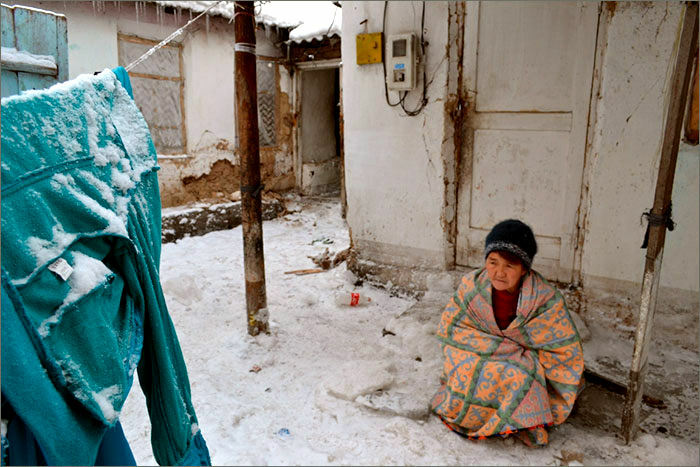 Her family was deprived of gas, which heats up her house, on the morning of Saturday 15 December. It has not been switched back on. Her electricity was also switched off for a day on that same Saturday. It came back only late in the evening on Sunday and then it was switched off every day for several hours. Thankfully, the family had coal and a gas canister. But coal fire is not sufficient. Thankfully Lada’s mother lives in her town flat and Lada has sent her two year old child to stay with her. Lada cooks on the street: there is no space to put the canister at home. 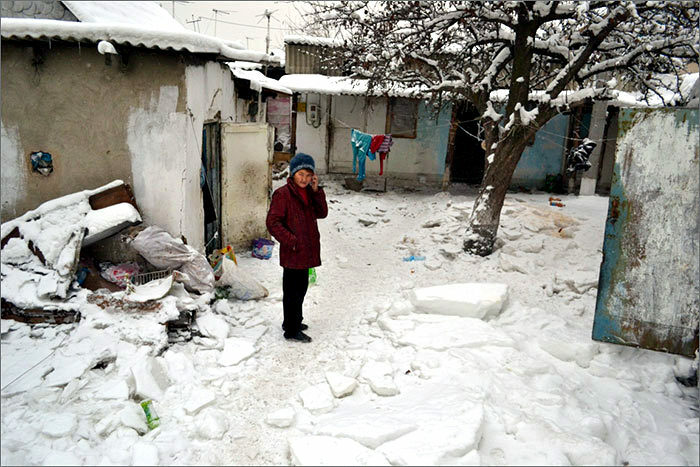 Unfortunately her family cannot move to stay with her relatives entirely: there is no space and the house cannot be left without coal heating for more than three hours – it won’t be possible to warm it up after that. And when it comes to electricity, even when they have it, the pressure is so low that it is not even enough to work at a computer, and you have to switch off all other electric appliances to operate the washing machine. Lada can be described as a conscious and educated citizen, who is prepared to stand up for their rights using all the legal methods available. “Yesterday I went to the meeting on the square, but it has not yet changed anything, there were too few people there. Now I am preparing a lawsuit against Kyrgyzgas. They have violated two points of our agreement, which we concluded: me as a consumer of the service and Kyrgyzgas a supplier. Point 3.1.5 was violated, that Kyrgyzgas must inform the consumer about planned limiting or switch off, indicating the reason, either through the media or through their representatives, three days prior. Recently, the deputy managing director of Kyrgyzgas said on TV that there was a force-majeure switch off. But they also violated point 6.1, which said that “force majeure is fire, an act of terrorism, implementation of the state of emergency, flood or other natural disaster.” Lada hopes that her lawsuit will be supported by other Bishkek residents. “To be honest, we are tired of living like this, without gas and electricity. Now we are looking for ways to move to Russia,” Lada admitted. We hope that the question of gas supply and the problems with electricity will be solved and the preparation of the Kyrgyz officials to winter will not lead to such lethal cases. 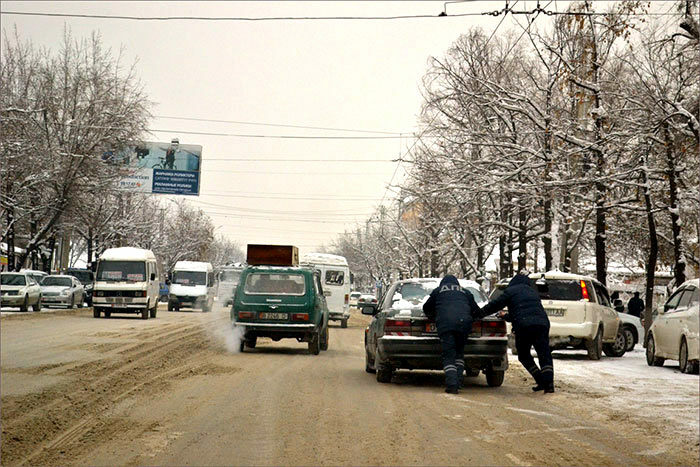 Especially because the lowest temperatures are expected in Bishkek on Thursday – down to -25 degrees.